There are so many swoon-worthy French touches you can add to a wedding. When I think of France, I think of three things: food, fashion and wine. Here are some simple ways to add some French flavor (literally and figuratively) to your event. * serve French macaroons or give them away as a favor. 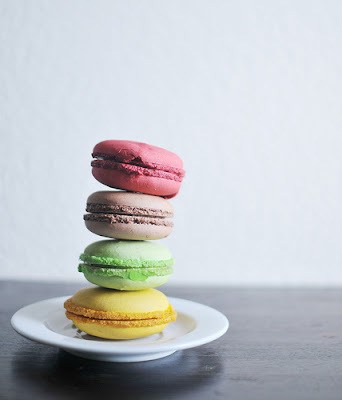 Oh my - have you ever had a French macaroon? They are delicious. Ridiculous. And they can be made in any color of the rainbow, so you could have them made in your wedding color(s). Guests will be delighted by the sight and taste of them. 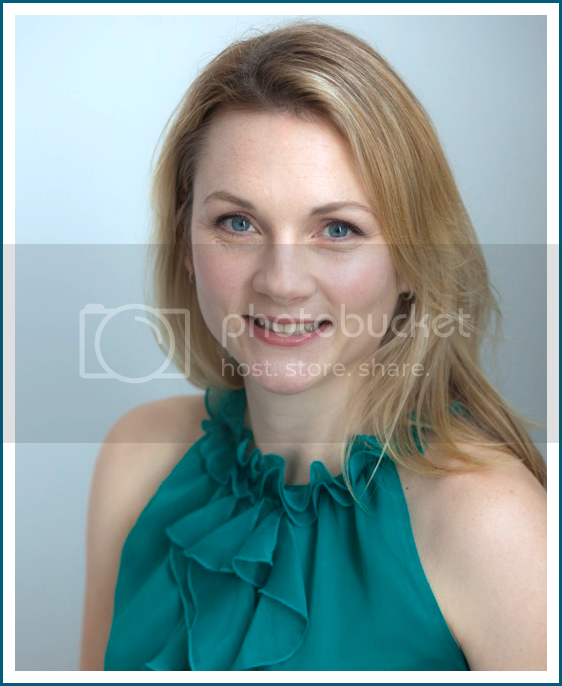 And if you have any extras, please feel free to send them along to your friends, the Swoon Girls. * have a croquembouche (french wedding cake) instead of a traditional wedding cake. 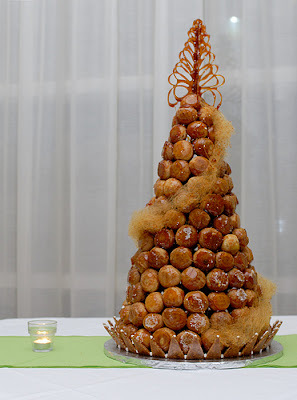 My friend Patti had a croquembouche as her wedding cake at her wedding a few years ago. Love this. Croquembouche is amazing: little pastries filled with cream, piled high and topped with spun sugar, nuts, and/or chocolate. Trust me: your guests will not miss the typical layer wedding cake for one second. 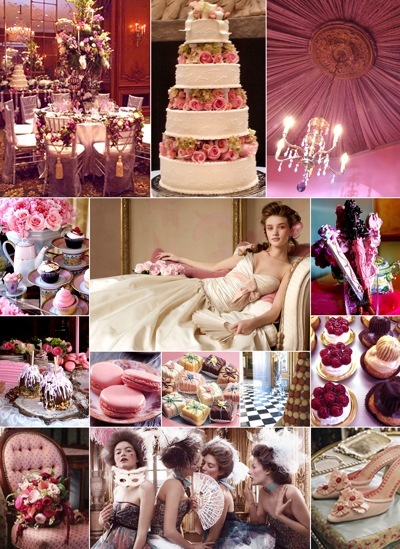 * incorporate lush French details: OK, I realize that Marie Antoinette is kind of the antithesis of Bastille Day, but you've got to give it up for her style. Rent the movie Marie Antoinette (with Kirsten Dunst) from a few years ago to get a great idea of the period's decor, fashion and style. So many lovely details. I found this inspiration board and had to share it. I could look at it all day long. Are you swooning over anything above? You know me: those shoes in the bottom right have my name all over them. Love.